Staff Senate is grateful for the 3-year term that elected UC staff representative, Jim Trelstad-Porter, has served. As his term comes to an end we are beginning the election process for the next elected UC staff representative. The overall Council structure is an outcome of the Shared Governance Report released in 2014. The goal is to establish advocates with deep institutional knowledge from across the campus community to provide recommendations on issues that affect the University’s commitment to its mission and values. Those eligible to serve on University Council are Augsburg staff with a .75 FTE or higher regardless of exempt or nonexempt status, not including union, MnEEP or temporary employees. Staff Senate members are eligible to serve on the University Council and/or its sub-committees. Staff members meet eligibility requirements as described above. Staff members have been employed by Augsburg University for a preference of two years or more. 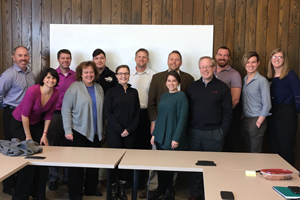 Staff members have demonstrated both leadership and the ability to work across departments in their tenure at Augsburg. Staff members are able to represent the staff perspective while advocating for the interests of the University as a whole. Staff members have a broad range of institutional knowledge. Staff members must demonstrate an understanding of the current campus climate. Staff members understand the University’s strategic goals and are dedicated to helping achieve them. The selection process for the University Council Staff Representative begins with an open call for nominations from April 15–22. Nominations are received electronically from any eligible voting staff members. Self-nominations, nomination of others, and nominations for Staff Senate members are acceptable. Nomination Form. Learn more about UC Staff Rep requirements, expectation, and election process. 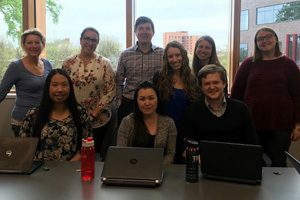 Augsburg University Staff Senate is composed of six members who are nominated and elected by their peers for a two-year term and two at-large members to be chosen, in every instance, by Staff Senate. All Staff Senate members have the option to serve a third year. Nomination Rights: Nominations are collected through the online form. An online survey will be distributed for the election of the two open positions and Staff Senate will select the at-large member. Composition of Staff Senate: It is recommended that members be at least .75 FTE, regardless of exempt or non-exempt status. Any questions please contact us at staffsenate@augsburg.edu. As members of Augsburg’s Staff Senate, campus-wide conversations in light of incidents across campus that have deeply affected students have reinforced the importance of committing ourselves to one overarching goal: to contribute to the well-being of our students. Nomination: Katie has worked in the undergraduate admissions office for a year now and has done a tremendous amount of work to help bring new and innovative ideas to help with recruiting and enrolling new Auggies. In her short time she has brought a more critical eye to improving campus events, as well as constantly pushing our office to think of how our policies effect underrepresented populations. She was instrumental in the push to move the campus into being a test optional institution, thereby removing a financial barrier for many of our students. Although she has been here for only a short about of time, her kindness and grace has touched every single one of her co-workers and she is absolutely living the missions and vision of Augsburg. Nomination: Augsburg Multicultural Student Services is 4 departments: Pan-Afrikan Center, American Indian Student Services, Pan-Asian Student Services, and Latinx Student Services. This fall, as Augsburg welcomed new students, with a yet-again larger percent of students from communities of color, we had an open position – the director, Pan-Afrikan Center. 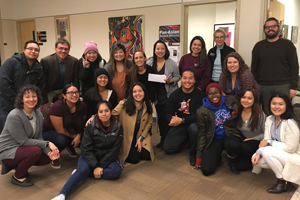 The current three directors, Ruby Murillo, Jennifer Simon, and Hli Vang orchestrated arranging the workload so they could be helpful to assist students who had work—and would work with the Pan-Afrikan Director. Besides individual work, it involved programs such as the Fall Leadership retreat (with 150-175 students, a welcome back event, and advising the Pan-Afrikan Student Union. To learn more about the Auggie Pride program and to make a nomination click here to visit our website. Join Staff Senate in the Commons over your lunch break to meet new colleagues and learn more about one another and how we work together. It’s a great opportunity to engage with colleagues from across the University, both for new employees and for those that have been here for years. Join us! Bring your own lunch and we’ll see you in the Commons! Nomination: Kristina has done an exceptional job as the program manager of the Riverside Innovation Hub, a 5-year project at Augsburg aims to help congregations to create innovative ministry and make meaningful connections with young adults. As a leader, Kristina always goes above and beyond to motivate and support team members to work for this meaningful project. She is understanding, loving, and caring. She is loved by so many people from Campus Ministry, Christensen Center, and the Religion Department. Kristina is a wonderful example of someone who is living out her faith to serve the community. As an international student, I have received tremendous support from Kristina as I was going through challenges of finding an OPT internship due to recent changes in regulations from the new administration. Kristina has been very passionate and determined about fighting for my rights as well as promoting interfaith and intercultural diversity on campus. Nomination: Catherine was interviewed for an article titled “One Nation” in the winter 2018 issue of St. Olaf magazine. 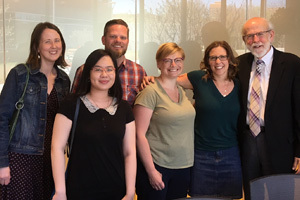 The article highlighted Augsburg’s commitment to supporting students who are undocumented, and Catherine’s hard work and passion for helping students. It is clear that Catherine takes pride in her work at Augsburg and our commitment to diversity. Read the article, On Nation. Volunteers are needed to help make signature events like commencement, homecoming, and the Nobel Peace Prize Forum a success. This is also a great way to meet staff from a wide range of departments across our campus. If you are volunteering during your regularly scheduled work time and would like to use your allotted community service hours, please check with your supervisor. Weekend or after-hours commitments are not eligible for community service and would be considered volunteer time. Roles include ushering, ticket taking, rehearsal support, diploma distribution, and more. Contact Kia Burton (burton@augsburg.edu) in Alumni Relations for more information. This is an excellent opportunity to engage with the Forum’s esteemed speakers, moderators, and laureates. Roles include registration, greeting, ushering, session attendants, and more. Volunteers are also needed for the Thursday evening VIP Reception. Contact Allison Mangan at mangana@augsburg.edu. StepUP Gala – Saturday, November 3, 5-8:30 p.m. Roles include registration, ushering, silent auction assistant, videographer assistant, and more. Dinner will be provided. Contact Martha Truax at truaxm@augsburg.edu for more info.